This wrapper addressed to Cyprus and with a stamp washed off, was recovered from the wreck of a British European Airways DH Comet 4B, G-ARJM mail plane that crashed soon after take-off from Ankara on 21st December 1961. 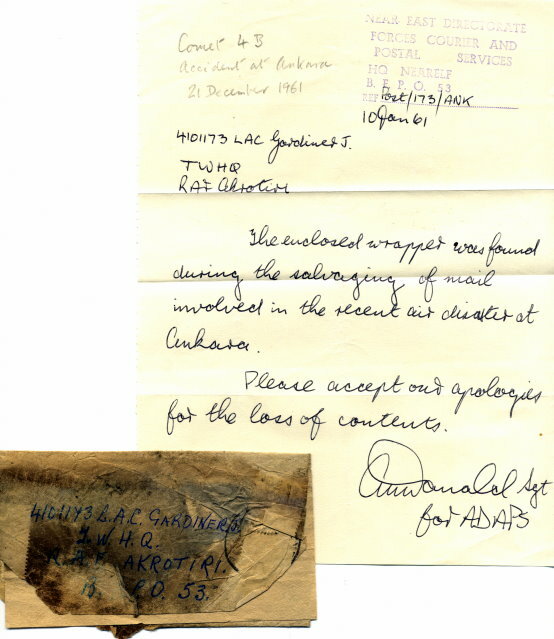 The associated letter dated 10th January 1962 (dated 61 in error), explains the loss of contents of the wrapper. The plane from London was heading for Nicosia and Tel Aviv.